A few days ago, we noticed that the content of the dryer load was still damp after the cycle. So we reset the timer and pushed the Start button. The Kenmore dryer has provided close to twenty years of dependable service and has been so reliable that we had taken for granted that it would “just work” whenever we pushed Start. So when we did not hear the familiar “thud, thud, thud” of the contents tumbling about, we were momentarily confused. After checking that the fuse on the electrical panel had not been tripped and that power was indeed getting to the machine (we could hear the timer on the dryer humming), we concluded that the problem must lie with the machine. Since we had no warning signs that the machine was having problems, we hoped that it was something simple, something which we could fix ourselves. However, before we could get to fixing anything, we had to figure out how to open they dryer so we could take a look around its innards. The older Kenmore dryers are fairly straightforward appliances, and accessing the various components turned out to be quite simple. NOTE: Before we did anything, we pulled the plug from the power outlet. We never poke around the guts of an appliance with the power plugged in. To do so would just be asking to become a potential candidate for the Darwin Awards. In order to get to the guts, the top of the machine must be removed. The main control assembly flipped up and the top cover slid off with no problem once the screws holding them in place (panel, cover) were removed. 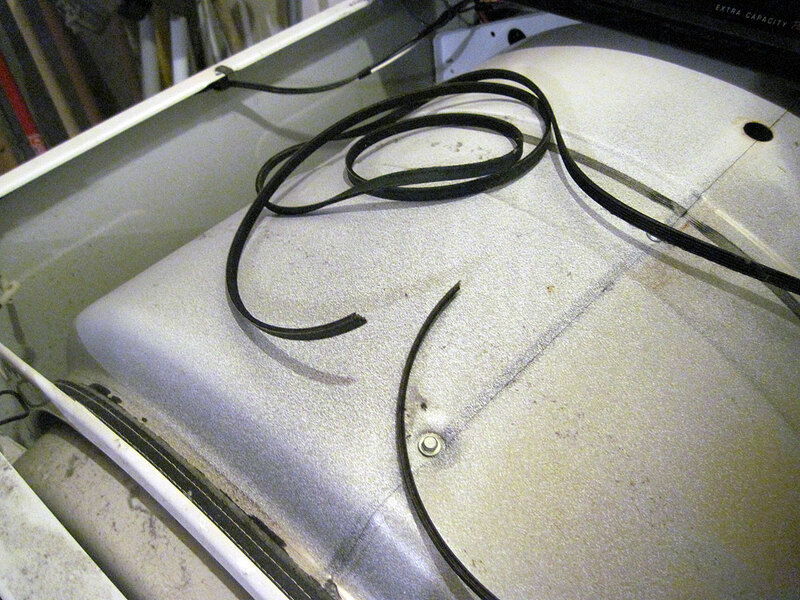 Once we had the top cover off, it was obvious what the problem was…a broken dryer belt. Disconnected the door switch sensor wire. Opened the bottom panel (it is just held on by a friction clip). Removed the screws holding the front panel in place. With the front panel off, the drum could now be removed. The dryer drum was very light (less than a few pounds) and was lifted out by one person. At this point, we had access to the bottom of machine housing the motor, the heating element, and the venting tube. While there are many sources for replacement parts, price can differ significantly. Since the original belt lasted for so long, we decided to get OEM parts for this repair project instead of trying aftermarket options. 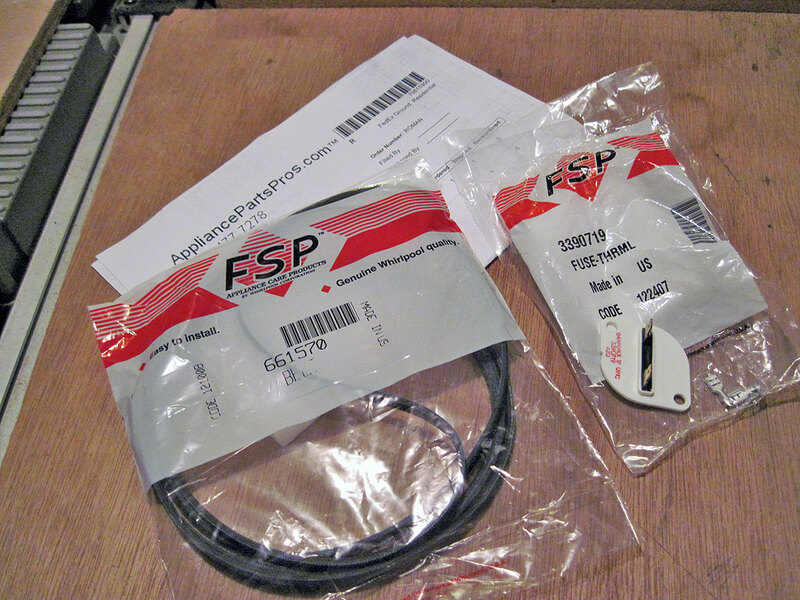 After looking around, we got our parts (belt, fuse) from with AppliancePartsPros, mainly because they carry genuine replacement parts for all major brands, have great prices, and their site was very easy to use. We got our parts in a couple of days and they were exactly what we needed. While the broken belt was the obvious problem with the dryer not working, there was another component which could also have been at fault. Dryers are equipped with a safety fuse called the thermal fuse. The thermal fuse is responsible for shutting off the heating elements if things get too hot. The thermal fuse in this machine can only be accessed after the drum has been removed. So we thought it would be worthwhile to get a replacement unit and change it along with the belt just to be safe. The part is cheap and it is good to have a spare on hand whether you need it now or not. Placed the belt around the drum, ribbed side facing the drum. Placed the drum back onto the machine with the belt dangling free. Reached under and loop the belt under the pulley and onto the motor spindle. This had to be done more or less by feel. Once we had the belt looped on, we put the front panel back on, and rotated the drum by hand a few times to be sure the belt was properly seated. We put the machine back together, pushed the button, and it started up just like the old days. 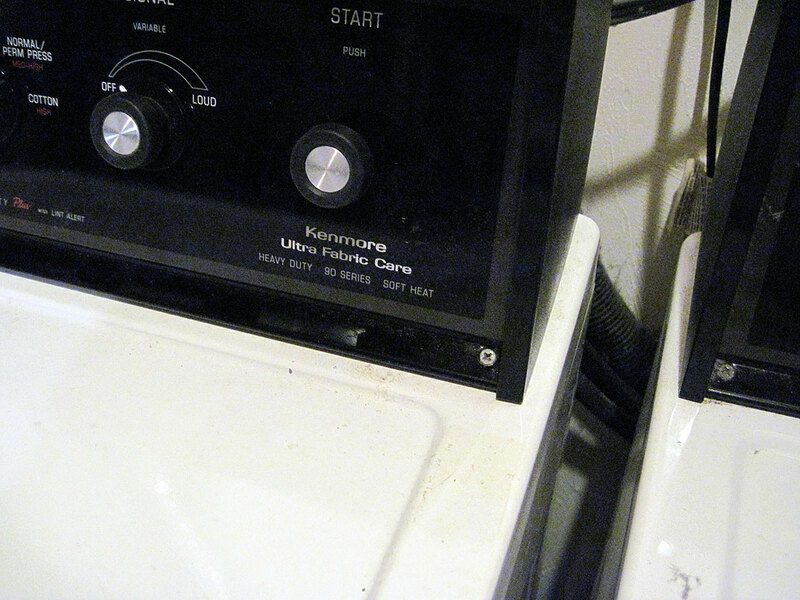 With it all cleaned up, we are confident that this old Kenmore still has plenty of years of service left in it. So if you have a dryer which suddenly stops working, check for the obvious failures (belt, thermal fuse) before calling for service or shopping for a new unit.